Jenny Doe reviews 'The Brain Show', from Robert Newman, plus a Q+A. You might remember Robert Newman as one quarter of the Mary Whitehouse Experience in the 80’s, or one half of Baddiel & Newman in the 90’s – the first stand up act to pack Wembley Stadium when comedy became the new rock’n’roll. He has been out of the limelight for a while, writing novels and becoming politically active in publicising concerns over climate change. Now he’s back on Radio 4 with his Entirely Accurate Encyclopaedia of Evolution. The similarly-titled book, The Entirely Accurate Encyclopaedia of Evolution, is published by Freight. He is currently touring his one man performance, The Brain Show. 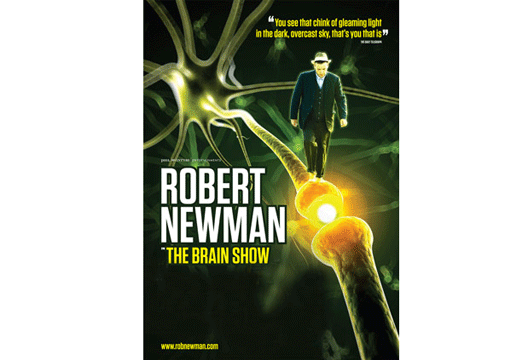 A fast and furious journey, The Brain Show opens with an account of Robert Newman’s experience as a research subject at University College London. He posits that the failure of the genome project to find direct correlates of human behaviour in our DNA has resulted in a shift of focus in this century, to bridging the gap between the physical wetware of the brain and the subjective experiences of our conscious mind. He skilfully takes apart the outlandish claims of researchers, for example, to have discovered particular gender biases in macaques, and intelligently questions the experimental paradigms of neuroscience, appropriately sceptical about whether neuroimaging data can accurately correlate with subjective experiences such as love, guilt or wisdom. A mesmerising storyteller, the point at which factual reporting blends into funny fairy tale fiction is not always clear. His erudite and splenetic critiques of key neuroscientific papers had the audience spellbound in silence, until, acutely aware of the need to navigate away from the dangerous rocks of pomposity, he burst his own balloon with a self-deprecating punchline, a song, or a delightfully silly prop. Robert Newman would definitely jump on the clumsily mixed metaphors of this paragraph, and find a joke lurking there. Riffing on Ramachandran and Baudelaire, we meet many of ‘the greats’ in this show - a thoroughly researched reverence for Charles Darwin is matched by a hilarious satire on Richard Dawkins’ less charitable view of evolution. We are regaled with wicked impersonations of a raft of celebrities including Brian Cox, Paul McCartney, and Winston Churchill; a story about Isaac Newton at the Fair; and a delightful set piece in which he personifies the Gulf Stream as an old girl getting pissed in a pub, grumbling about climate change. Even Sigmund Freud makes a brief cameo appearance, as do many wondrous creatures from the natural world, for example the Peruvian spider who fashions decoy spiders out of the debris of her prey. The threads of all these and more are woven into the rich texture of the first half of Newman’s set, which broadens out in the second half to concerns beyond the individual brain to critique the ideology of the selfish gene and make a case for co-operation and group selection. He pulls these torrents of ideas together with a couple of winsome songs accompanied by his ukulele, and a very funny personal anecdote for an encore. Although the show is thick with complex ideas and wide ranging references, the lucid delivery meant that my teenaged son enjoyed it as much as I did. Robert Newman strikes the perfect balance between scalpel-sharp analysis, romantic optimism and generous, genuine humour. What made you decide to take part in the UCL neuro-imaging research which you describe in the opening of the show in the first place? It is a made-up story. What’s your pot bellied ukulele called - is it a mandolele? That's a nice neologism. It was handmade in Bolivia but I always assumed it was just a regular uke - but you've set me thinking that maybe it is an actual Bolivian instrument. You describe one theory that the human smile is halfway to a grimace, but could equally well be halfway to a laugh – well, if you watch babies, they do a sort of pseudo smile whilst trying to fill their nappy or bring up wind, but a genuine social smile at just a few months old, which has no quality of a snarl – discuss? I wouldn't call it a pseudo smile. If you could add a new subject to the school curriculum, what would it be? If you had pursued a career in science, what field would you most have liked to be involved in? What made you choose Jenni Murray as the voice of your Encyclopaedia on Radio 4? Are you a man with a woman’s shadow? When I turn my belly sideways to the sun, I find that I am - alas - a man with the shadow of a marrow. I was doing that voice first. Russell Brand appears to be influencing the political thinking of younger generations, do you have further evidence that comedians can change the world? You’re careful to pepper your comedy with self-deprecation – is this a defence against accusations of arrogance, or are you truly beset by self doubt? You supply two-thirds of your own answer by your use of the word ‘careful’, which suggests more pre-calculation that I am aware of. You explain how the ‘failed’ genome project has given way to neuroscience, in an attempt to explain the physical brain correlates of mind and subjective experience. Do you think it needs explaining? If so, for what purpose - who will benefit from being able to map the mind? If there are more connections in the brain than there are atoms in the universe, then it is impossible to map the mind. Have you taken the Turing test? Did you pass? Would you agree to be a passenger in a driverless car? If you had a cat, what would you call it? How do you manage to keep sane in the 21st century? Do you meditate or practice mindfulness? Grow petunias or crochet tank-tops? It's much easier than keeping sane in the 17th century. You have studied evolutionary psychology. Do you have any thoughts about why the capacity to become depressed might have been selected for? There is a whole lot of specious stuff about possible reasons for selection of depression, but as Stephen Jay Gould says, evolutionary psychology’s 'Just So Stories' are kind of like Creationism: a place for everything and everything in its place. Who said sadness has to have a purpose? Or joy? There is nothing in Darwinism to support such a view. - The Brain Show is touring through the rest of 2015, plays at the Soho theatre in London from 11-23 January 2016, and then tours again throughout February. Reviewed by Jenny Doe, who is a Clinical Psychologist with East London Foundation Trust.